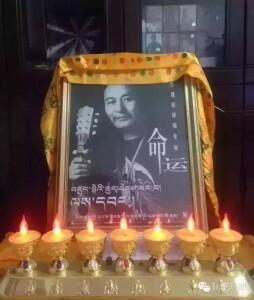 Dubey, from Amdo province, was a prominent, respected and much loved singer and songwriter, he was affectionately known as the ‘Cuckoo of the Snowland’ – Gangjong Khuchuk. 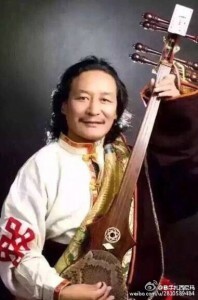 Dubey rose to fame in the 1980s through his albums and he also composed many classic contemporary Tibetan songs such as “The Sound of Unity” by Sherten and “Land of Snows” by Dekyi Tsering. 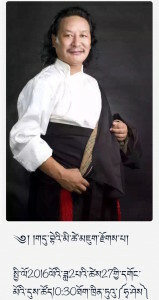 Dubey would sing in a traditional Amdo style (dunglen) and famously introduced the mandolin to Tibetan music. News of his passing has circulated quickly amongst Tibetan netizens on social media such as Weibo and WeChat. Ever since going into hospital for medical treatment, Tibetan writers such as Theurang and Kyabchen Dedrol had written tributes to Dubey and posted them online. Below are two poems from earlier this month and also a prose piece by Dungkar Yonten Gyatso. Thank you to Bhuchung D. Sonam for sourcing the materials and for the timely translations. Photo Taken from Weibo. News of Dubey’s passing circulated quickly on social media amongst Tibetans. * Translator’s Note: Pangyen Metok, literally meaning ‘ornament of meadow’, is a bright blue flower that generally grows abundantly on meadows of the Tibetan Plateau. Intensifying too the joy that carries life ahead. Dubey, widely known as the cuckoo of the Tibetan Plateau for his music, was my favourite musician. I grew up listening to his songs such as “A Sad Song of Wild Animals” and “A Song for the Panchen Lama” made me cry with emotion. These songs sowed a seed that grew into a tree of patriotism and hope. His songs, with their melody and great lyrics, are laden with the smell of tsampa or the barley flour – the staple Tibetan food – and fragrance of milk. He has offered countless songs as gifts for the Tibetan people. His music is a bridge of admiration and warmth between Dubey and I. The moment one hears his music one could visualize his features and expressions. One could listen to his songs again and again without getting tired or bored, and his songs reflect Tibetan way of life and culture. Since the 1980’s, Dubey composed and performed countless songs covering a vast array of subjects such as education, spiritual, patriotism, love, nature, environment and folklores. 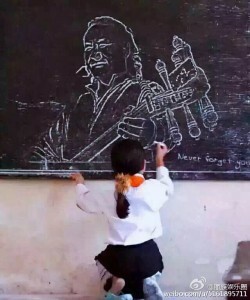 The fact that he engaged in creative arts for all these years to offer thousand of songs to the people of Tibet is an incomparable achievement in his life. His message through his music to those who cannot read or write is also beyond comparison. He had influenced and nurtured a new generation of singers and musicians, who are now composing and singing like Dubey. Many artistes have covered his songs and hence we can certainly call him the father of Tibetan music. Without him, half the music is gone. When Dubey fell ill at the end of last year, hundreds of Tibetans, both old and young, became anxious and took great interest in his condition. This clearly showed that he was a true creative artist who inspired people with his music. He had neither wealth nor official position to popularise himself. It was the power of his music and truth that won people’s hearts. When he was in the hospital, people ranging from high lamas to street beggars voluntarily contributed to his treatment. One doubts if a high lama, who supposedly works for others benefits, would gain such respect and solidarity. The fact that people had such affection and admiration for Dubey is a sign that people have such deep hearts. It is clear from rumours created about Dubey’s illness that there are a few people who are jealous of him and creative skills. These gossips include a rumour that Dubey had drunk himself to death or that he needed more funds for treatment. Even if he did need money for further treatment, what was there to be ashamed of? Everything is impermanent in this world and so is a human body. It is laughable that he was accused of drinking too much when Lamas are climbing down from their high thrones to disrobe, to engage in mundane activities and to discriminate between friends and foes. What can one say to an ordinary person? When a Lama marries and drinks, we say he is performing miracles. When one thinks about these, one can also say that Dubey was also performing miracles when he was drinking. Who are we to say that someone has gone beyond his limit? We should not fool ourselves.